Coming October 22, 2016. No, you are not imagining things…it is a big group of gorillas and a smattering of yellow bananas in running shoes! 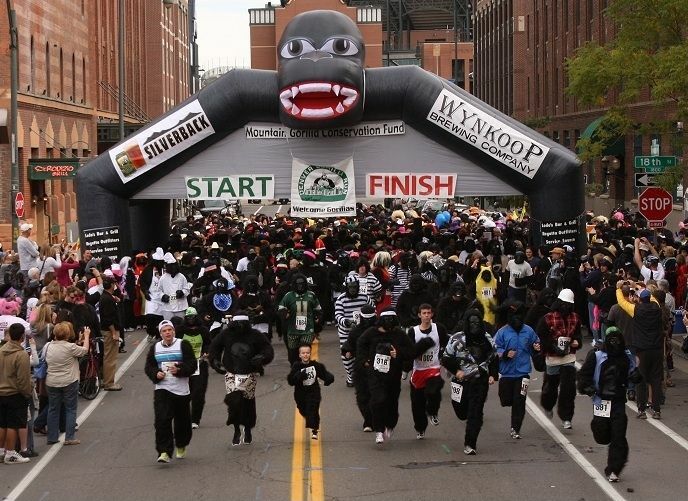 Get ready for the Denver Gorilla Run, a fun 5K event that is a benefit fundraiser for the Mountain Gorilla Conservation Fund (MGCF). The MGCF is an international charity dedicated to saving the Mountain Gorillas of Rwanda, Uganda and the Democratic Republic of the Congo from extinction. When you sign up for this race, they provide you with a gorilla or a banana costume (your choice), and the suit is yours to keep after the race. Besides a fun race, there will be a costume contest, a Great Silverback After Party with plenty of food and drink, great prizes and awards, and live music.